I love using young people in kids ministry. I believe that they are the ones that help make the ministry move forward. They provide you with new insights of what's going on in their part of the world. Believe me, their are times where I feel that I'm getting old for this, even though I'm 28 years old, LOL. But I thank God for my group of teens each day. Every Sunday morning at my kids church, we use teens and future teens to help us run our kids services. As you see in the picture above, we use them in different ways, such as; running sound, lights, powerpoint, DVD, DJ, Cafe' Manager, Set-Up & Tear-Down and much much more. Don't get me wrong, I do use adult leaders in kids church, but the young gen are the future kids pastor's and future leaders of kids church. My goal for them is to have a passion for ministry and of course for God. One thing I do with them is, TRAIN THEM. 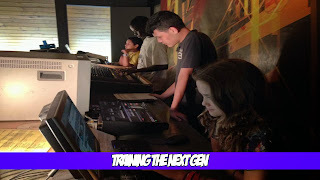 We have them come in on a Saturday or even early on Sunday morning to learn NEW things either on the soundboard, propresenter or even lighting. TRAIN your kids! They love to learn NEW things. I know some kids pastor's who love using kids and teens but I also know kids pastors who don't. I encourage you today to use them, TRUST ME! they will be a lot of help to you if you use them. * True story: I had one of my young girls open up an Instagram account for our kids church while I was not even thinking about it. Now I have TONS of kids and parents following us on Instagram!